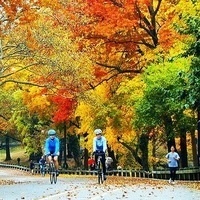 Take a leisure ride around Central Park! Includes: bicycle, helmet, and student staff. Subway fare NOT included. Check in at Liberty Bicycles (846 9th Avenue, between 55th and 56th Streets) by 1:30 p.m.
You must have medical insurance to participate; you will be asked to list your policy carrier and number upon registering. Bring your New School ID and insurance card with you to the event. Registration closes 10/7 at 4:00 p.m. Sponsored by the Department of Athletics and Recreation.